Last night any DStv subscriber who tried to watch the opening ceremony and first match of the 2014 FIFA World Cup on ZTV got a blocked screen with a message highlighting how access had been restricted and that World Cup matches would only be available on Supersport. This was frustrating for DStv subscribers who had not paid for any of the bouquets with Supersport. The only alternative in this case was to put up the old(and probably forgotten) antenna and catch the action straight from ZTV’s feed. We recently received a statement from MultiChoice regarding this issue. 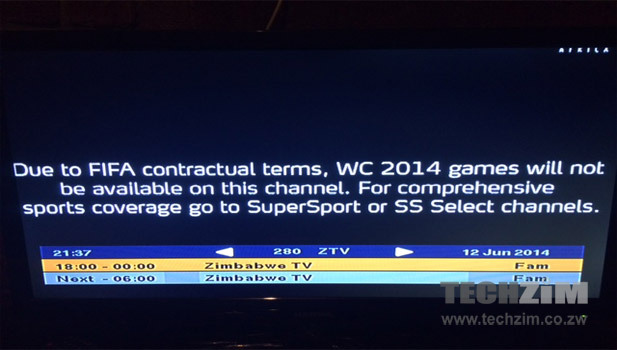 DStv has gained permission from FIFA to allow Free To Air channels like ZTV for Zimbabwean viewers to be accessible for viewing World Cup matches. This means that you can still catch your action on Channel 280 and put away that antenna again. MultiChoice would like to inform DStv subscribers that it has obtained special permission from FIFA to allow FTAs on these platforms to be accessible to customers wishing to view the World Cup, as these are the only pay TV platforms authorised to screen the World Cup. All FTAs on these platforms are therefore not required to block their signals and subscribers will now be able to view the World Cup games on any channel they choose to select on pay TV platforms. We wish all a lovely World Cup season! One would hope that ZTV legally acquired FIFA World Cup screening rights. If they did then I dnt see why they would block them from screning!